This winter, you'll want to be prepared with strong windshield wiper blades since visibility is key to your safety. The Mighty Tec-Select Wiper Blades available at Eddy's Toyota of Wichita are a quality choice and a great value at only $9.99 each! Each Tec-Select blade is fully tested, and uses crimped joint construction to make it stronger than plastic or metal/plastic frame blades. They're also priced to compete with plastic and economy metal windshield wiper blades, so you'll get great quality without great expense. Mighty Tec-Select Windshield Wiper Blades use a molded rubber squeegee that lasts longer and resists extreme heat and cold better than ordinary windshield wipers. Come to Eddy's Toyota to get your Mighty Tec-Select Windshield Wiper Blades today! Eddy's Toyota of Wichita is your one-stop source for all things Toyota. That includes quality replacement parts and practical accessories to personalize your Toyota. At our parts store, you'll meet a friendly and professional staff that's ready to help you find what you're looking for. Our professional technicians can also install your parts or accessories for an additional fee. You can always call our parts center with your questions, or to put an item on hold, at (316) 652-2226. 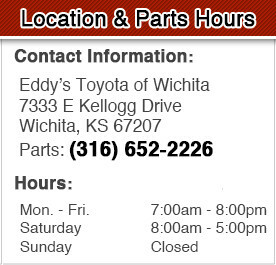 Eddy's Toyota is located at 7333 E. Kellogg, Wichita, KS 67207, serving Hays and Salina. We're also proud to have customers from the Oklahoma areas of Tulsa and Enid. Come on! Come on! Get Eddy-fied!